Notes: We have three chanterelles locally, none of which are the European Cantharellus cibarius. 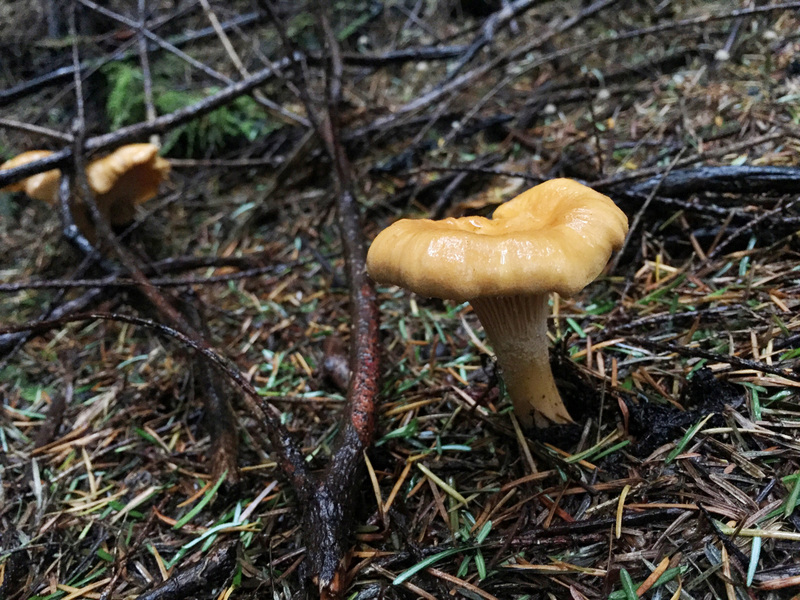 The White Chanterelle has always been distinct, but it wasn’t until 1999 that the Pacific Golden Chanterelle was separated from the European chanterelle, and 2003 that C. cascadensis was first described. The white chanterelle usually appears first and is white to ivory darkening to rust colors. Next up is C. formosus which has a yellow/orange tawny and fuzzy cap over paler yellow flesh. The later season C. cascadensis is yellow-orange to orange, usually larger with thinner wavy caps and may fade to white in the center. Our typical apricot-orange chanterelles may be either C. formosus or C. cascadensis. C. cibarius var. roseocanus may also be found in pine or spruce habitats and has a pinkish cast on the young caps. Brown the chicken in 2 oz. of the butter over medium heat. Add the shallots and saute 2 minutes. Add the brandy and flame off the heat. Add the port and stir up the browned bits into the sauce. Add salt and pepper to taste, stock and cream. Simmer covered over medium low heat 30 minutes or until the poultry is tender and done. Remove chicken to a serving dish and keep warm. Reduce the sauce until it is nice and thick. Meanwhile cook the chanterelles with the remaining butter over medium high heat until their juices are evaporated. Add the mushrooms to the reduced sauce and simmer together for a few minutes, stirring frequently. Adjust the seasoning and pour over the chicken.